Lots of excitement at #92 this week as the house is stripped back to the raw wood on the clapboards. For the first time we see the original color of the house which was called “drab”, a grey-olive color. Since 1996 the house has been tan under McGinn ownership during the opening years of the B&B , and a strong green which was applied in 2004 under new ownership. The new treatment, called “rhino paint” comes with a lifetime guarantee and is advertised as the toughest paint around. The crew is doing a great job of prep work and the glimpse of the raw wood while the paint is completely removed offers some detail as to the way things are put together. 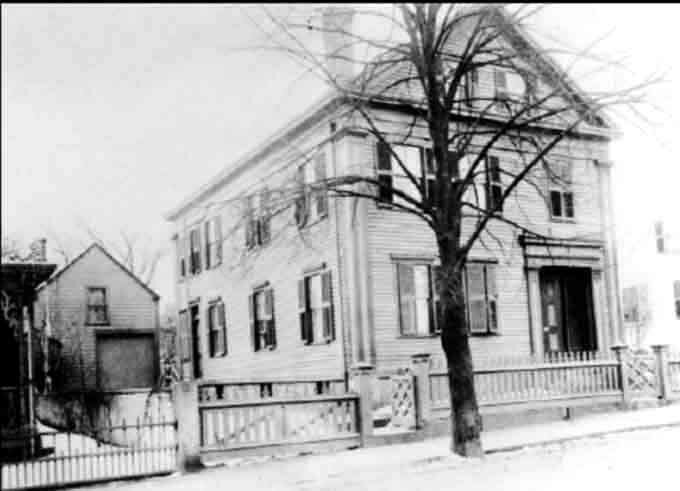 The side entry porch overhang was not original to the house and was added after the 1892 murders. The new paint color will more accurately match the drab paint color of 1892. The darker trim paint currently on the house was a very close match to the 1892 color. The weather cooperated this year, with clear blue skies, lots of sun and just a chill in the air to remind us Christmas is two weeks away. This year decorated trolleys made the round of houses, which helped speed things along and spare weary feet as they climbed the hills of The Hill section of the city. Homes on Belmont, Lincoln Ave, Cherry St. and Rock St. threw wide their doors to an appreciative throng of visitors. Fires crackled merrily, the fragrance of cloves and cinnamon, hot mulled cider and balsam flooded the air as decorations were admired. Period furnishings, historic photos and mementoes, and homey touches were appreciated by all who were lucky today to enjoy the insides of magnificent homes usually only glimpsed from the street. 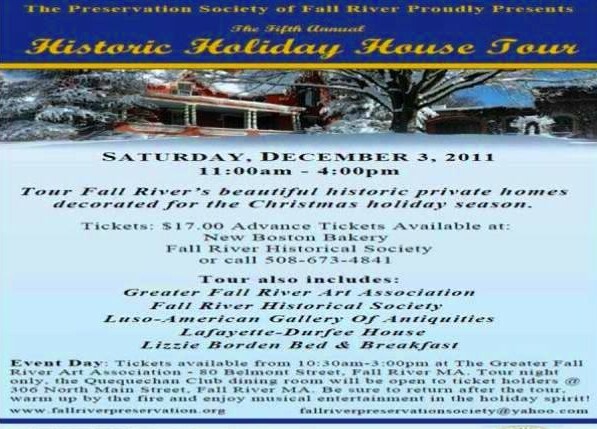 The Fall River Historical Society outdid itself this year as well, and all agreed that this was the best year ever for the popular house tour. At 4:30 footsore house tour guests were treated to a concert of holiday music by the Durfee High School String orchestra. All in all- a perfect day. Thanks to families participating this year. It was grand! 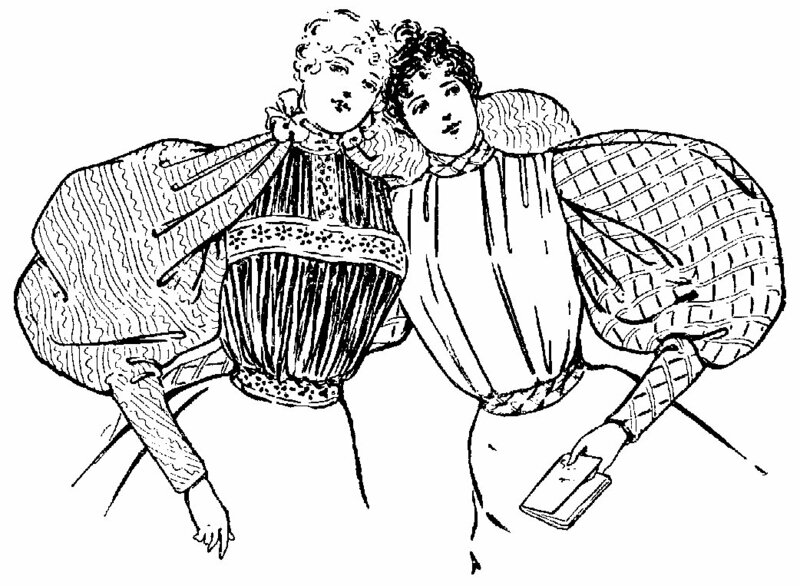 W&W will return on the 18th with photos of all the Victorian fun, fashions and amazing Painted Ladies! 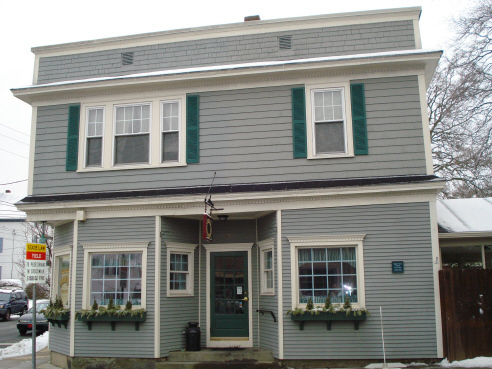 One charming and friendly eatery not to miss when visiting Fall River is the New Boston Bakery on New Boston Road. 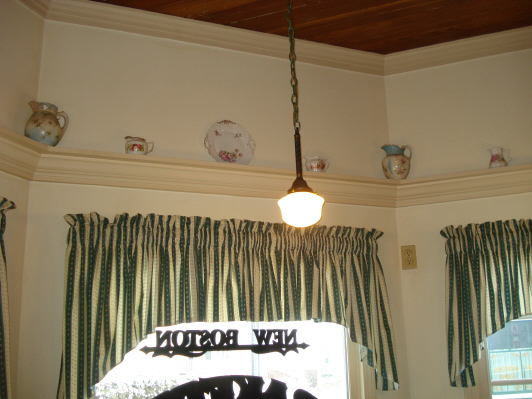 Breakfast and lunch feature home made pasteries, soups, and sandwiches, prepared fresh on the spot in a cozy decor of lace, teapots and Victoriana. 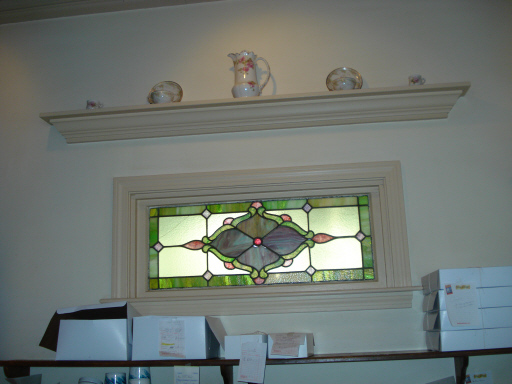 The owners, who are preservation- minded, have retained all the old charm of the building and even saved an original stained glass panel. New Boston Bakery is closed on Sundays. 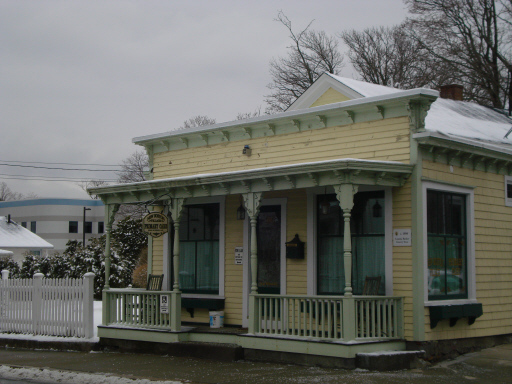 Also be sure not to miss the gingerbread gem next door, the former 1890 Leanna Barker Grocery Store which has been beautifully restored. 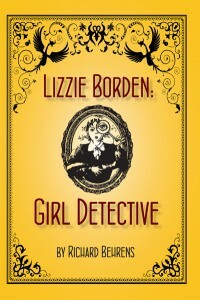 It’s no wonder Lizzie Borden wanted to belong to the stylish Central Congregational Church at 100 Rock Street. 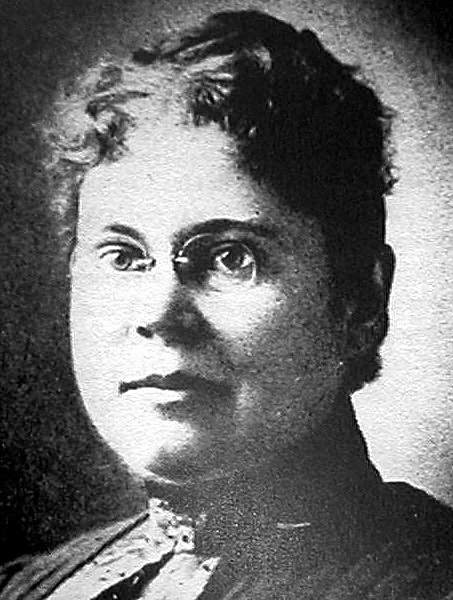 Many of the fine mill owner families from The Hill were congregants there. 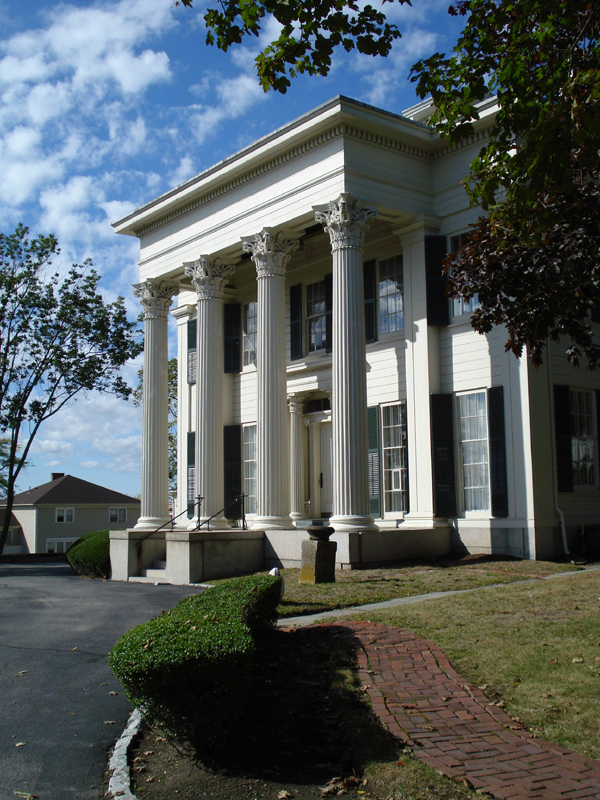 Listed today on the National Register, the granite, Nova Scotia freestone and red brick edifice was designed by Hartwell and Swazey (also architects of the Academy Building) in the Ruskinian Gothic Style, in 1872. 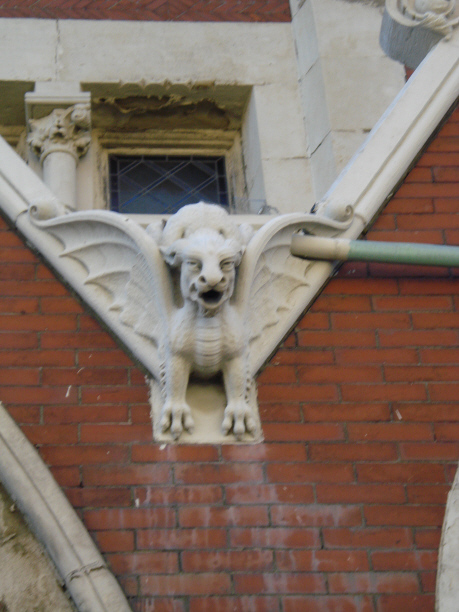 It is the only church in Fall River which features gargoyles on its exterior facades. Just a little late in finding this feature! The city paper has added a blog with YouTube footage of the recent Victorian Christmas tour. This one features the Historical Society gift shop and recreation of McWhirr’s Department Store. Hopefully there will be more. The link below should take you to the video and article by staff reporter, Debbie Allard. 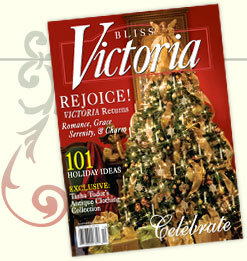 It was a red letter day when Victoria magazine returned to the shelves this month. 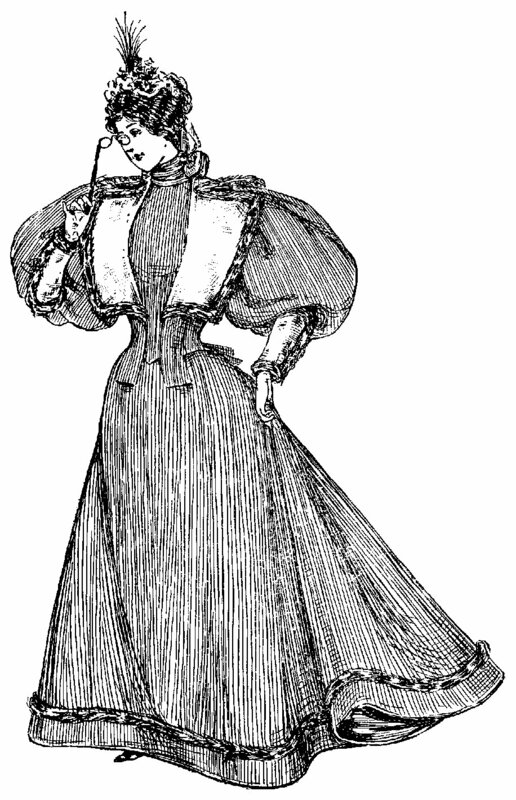 There are very few publications on the market at present which feature articles on Victorian homes and Victoriana, Victorian Homes and Country Victorian were the last two after the Hearst Company cancelled Victoria a few years ago. Fans of the glorious magazine, filled with lavish photography went into mourning. Now under a new company management, Victoria has returned as beautiful as ever with features covering all aspects of Victorian life and style. 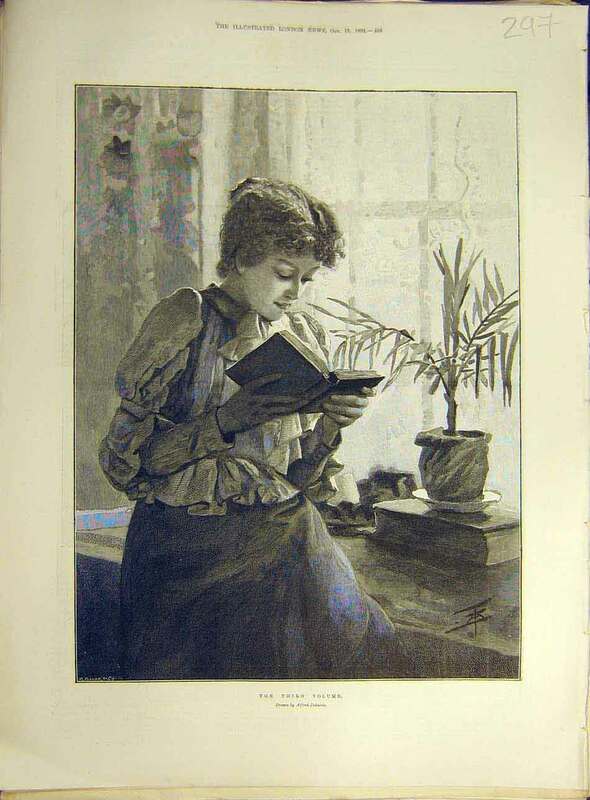 Instead of monthly, the magazine will come out only 6 times a year as it did when it debuted. There is also a website and forum and a free online newsletter and magazine excerpts-what a great Christmas gift! After a wet start to the weekend, the sun burst forth Saturday about 2 p.m. and left the Painted Ladies of Rock Street refreshed and ready for their close-ups. 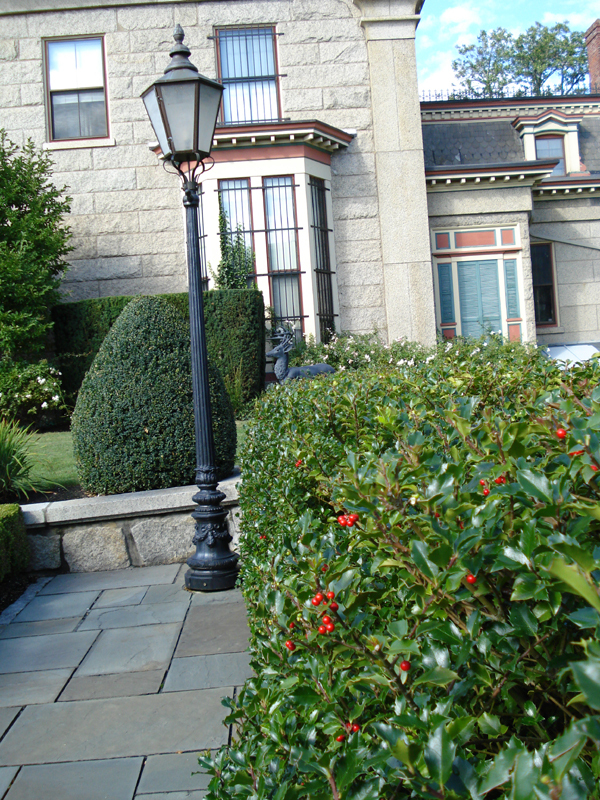 The Victorian garden of the Fall River Historical Society was glistening with raindrops, the heavy pink heads of late summer roses bending low. Already the holly hedge is thick with ruby berries, portent of Christmas to come. 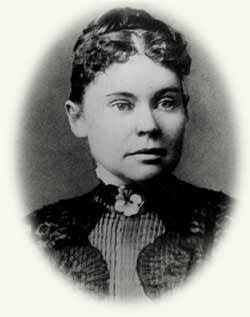 Who can blame Lizzie for wanting to live up on The Hill? 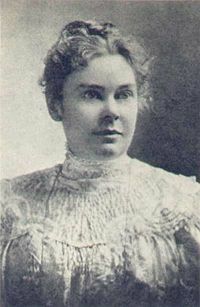 The term Painted Lady came into the American vernacular with a popular publication featuring San Francisco’s lovely old Victorians, which were being lovingly restored and painted in ice cream parlor shades in the 1960’s-70’s. Every city has a few of these grande dames from another era. For awhile they became white elephants, cut up for multi-family units, condos, or business offices. In the 1970’s, with the gas crisis, nobody wanted a Painted Lady with her 10-12 foot ceilings to heat. Finally, preservationists and homeowners everywhere are coming to appreciate the intricate gingerbread, interior woodwork, tin ceilings, hardware, stained glass and irreplaceable beauty and craftmanship of these gracious old homes. 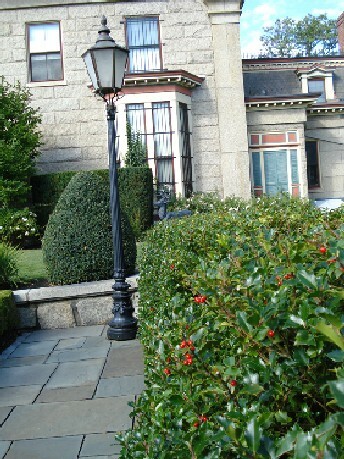 The Hill area in the north end of Fall River boasts a plethora of Painted Beauties from Rock, Belmont, Highland Avenue, Underwood, High, French, Lincoln, North Main and Maple to the south end of town. This little album is one of several to come extolling the grandeur and the glory of old Fall River homes, churches and mills.